Why should we refactor this code? If it’s working fine and doesn’t change often, we shouldn’t refactor it. There is no reason to sit and polish something if you are not going to get a return on your investment. On the other hand, you should refactor this code if you have to touch it even semi-frequently. My main contention with this code is that it’s complicated. If I were to ask “when does this function return ‘threshold’?”, you’d need a minute to answer. If I want to change the reasons for returning “peak”, I first need to figure out under what conditions we actually return “peak”. Everytime I have to do anything with this function, I need to pay a cognitive tax in order to remember what it actually does. Alternatively, I’ve heard this code smell called the Indent Hadouken. When refactoring, our intent is to improve the state of the code without changing any of it’s behavior. As I make changes, I like to have immediate feedback telling me that my changes did not affect the behavior of the code. The best way I know how to do that is to write tests. If I surround the function I intend to refactor with tests, I can run those tests each time I make a change in order to confirm that I have preserved the function’s behavior. It is worth noting that the structure of our test names looks similar to the structure of our code. Our test names feel complicated because our solution feels complicated. With our tests in place we can now begin changing some code. The first if statement is now a sort of guard, it only lets in bpm values that are within our range. If the given bpm is outside of our range, we return “none” immediately. This kind of statement is known as a guard clause. We’ve also removed a duplicate statement – before we had two return "none" statements, we now have one. This code is doing the same thing as the original example, but is much easier to read. Ah, I really like this. The code has the same behavior (we know this because all of our tests still pass), but is much easier to read and just “feels simpler”. The “feels simpler” bit is incredibly important – code that is hard to read or conceptualize slows you down. 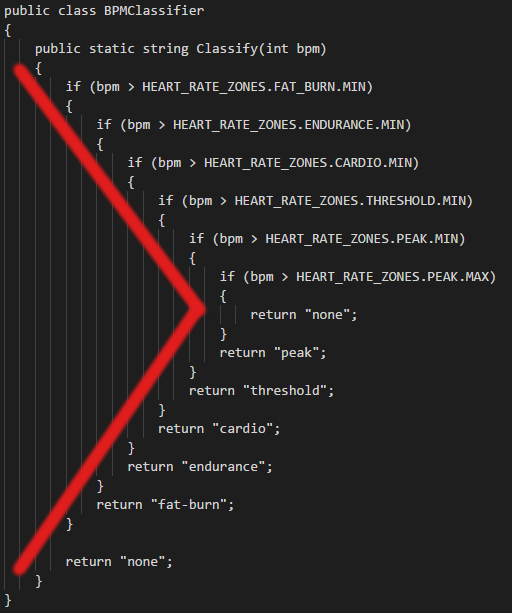 Sometimes when I refactor code, I go through a process of “expansion and contraction”. In this case we experienced the expansion by negating all of our code. We added additional code in order to flatten out our structure. Now that our code is more readable, let’s see if we can remove the negations that we added. I feel good about this solution, it is less complex and more maleable. I hope that by showing each stage in our refactoring, you’re now better equipped to deal with nested if statements. I’d love to hear what you think.